Tara - Somebody described it as working out how a Swiss watch works by bashing two really expensive ones together and trying to reconstruct what’s in there from all the bits that fall out. It takes two beams of protons, which are hydrogen nuclei, and it circulates them in opposite directions around this ring, and it accelerates them until they’ve got loads of energy, until they’re travelling just a few metres per second less than the speed of light. And then those beams are steered to smash together at four points around this ring where we build our experiments. And it’s what goes on when those beams crash together which is the key to our whole investigation because when those proton beams smash together what’s actually going in is the tiny tiny instance of time, the tiny area of space, we have so much energy that we can dissemble matter to its fundamental constituents, and we can make new fundamental constituents from that energy. And our experiments act as gigantic 3D cameras and take snapshots of the traces these particles leave behind when they zip out from the collision point and deposit their energy throughout all our detector material. Adam - Probably the most famous result of the LHC is the discovery of the Higgs Boson for which François Englert and Peter Higgs were awarded the Nobel Prize in 2013. Tara - The Higgs Boson is an absolutely integral part of the universe. Well actually, the integral part of the universe is something called the Higgs field. It’s a type of energy field which is present throughout the universe. And the reason that this is such a big deal for us is that we think it’s this field, and the interactions that fundamental particles have with this field as they move around the universe that gives fundamental particles their mass. Which might not sound like a particularly big thing but it’s absolutely necessary for us to be able to make sense of the way particles behave, of the way the forces govern particle behaviour have their particular strengths. And this field, and the particle, the Higgs Boson that’s associated with this field is an absolutely integral part of our theoretical understanding of what’s going on. 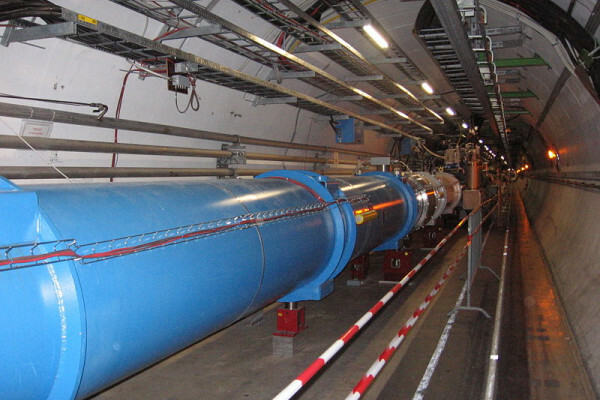 The LHC was designed so that if the Higgs Boson existed, then we should be able to see it. And indeed, back in 2012 we did see the first observation of this particle, and then ever since we’ve been gathering more data. Adam - What has the discovery of the Higgs meant for science? Tara - What the discovery of the Higgs Boson did for us is it filled in the missing parts in our current understanding of matter. It’s like having a jigsaw and getting those last pieces and sticking it in, and then all the pieces lock together and you’ve got a coherent picture. You know, you can see it in front of you; it works; it’s brilliant. You can’t overstate what an important step forward that was. Tara - As well as being constructed to try and find the Higgs Boson, the LHC is really a discovery machine. Although we’ve been going 10 years, we’ve only taken about 5 percent of our ultimate dataset. The LHC is a real long term machine. We’re thinking that it will carry on until 2035, maybe even a little bit longer, so there’s an awful lot more data to come. So if you think what we’ve already done with the 5 percent of data that we’ve got with the discovery of the Higgs and all these other investigations that have told us more about the limitations of our theory, and the limitations of our alternative hypotheses, I can’t tell you what’s going to come out of the next 95 percent. This is the thrilling thing about doing research. The data that we’re collecting tells us something new and I’d be foolish to try and guess what’s out there. Adam - What was it like to be a particle physicist that first day ten years ago? Tara - Oh, it was just amazing to see the evidence for this first beam go round. It was quite awe inspiring actually when you think of all the engineering, all the design, and all the work that had gone into this machine and yet it worked when they switched it on. I still find that incredible. It’s a massive endeavour. There aren’t many massive endeavours on this scale. For us, it’s almost akin to the Moon landings and the space race in terms of going out there and finding out what there is. It’s another one of these endeavours of mankind that make you think that mankind at heart is brilliant if it can do this sort of thing. Previous Why bother looking good? Can we talk to dolphins?